I am ahead this month! Actually it wasn’t planned, but I was working on this little project and since it was the same size as the others, I decided it could be my journal project. I didn’t really plan the project out at all. 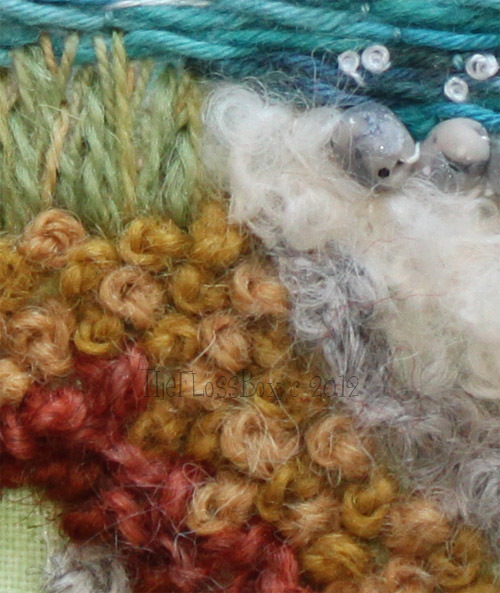 I just started with the water, then built up the land area with some different types of yarns. I made the rocks along the shore out of fimo clay, as are the bigger rocks. I didn’t work off a photo, but I did take inspiration from my time along the coast in SE Sweden. It’s very rocky and in places there are a great number of large boulders. There isn’t much by way of sandy beaches, but the coast is interesting and varied! Hey, wow! I thought the rocks were beads! 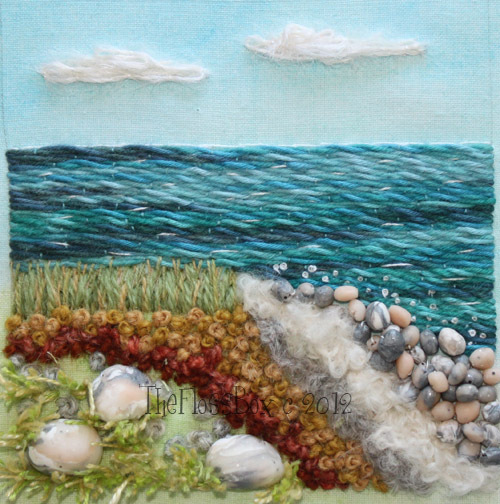 The whole project is lovely – from the beautiful undulating waves to the handmade rocks! Very impressive.